Native app: An event app downloaded from an app store and kept on your phone or tablet, only requiring an Internet connection to update data. HTML 5 app: An event app that is essentially its own mobile website and therefore does require an Internet connection to maintain its real-time live-action experience. Not distributed through the app stores. Hybrid app: An app that works both online and offline (without Internet). Features such as agenda, exhibitors and maps are available offline as with a native app. Networking features such as meeting requests and social posts require a login to the mobile app website, as with an HTML 5 app. User Interface (UI): The screens in your event app that allow the attendee to navigate through the app and consume the information found there. UI issues range from how well the event app showcases your branding to how to tailor the navigation for ease of use. API (Application Programming Interface): The programming rules and standards that must be met in order to access an Internet-based software application. 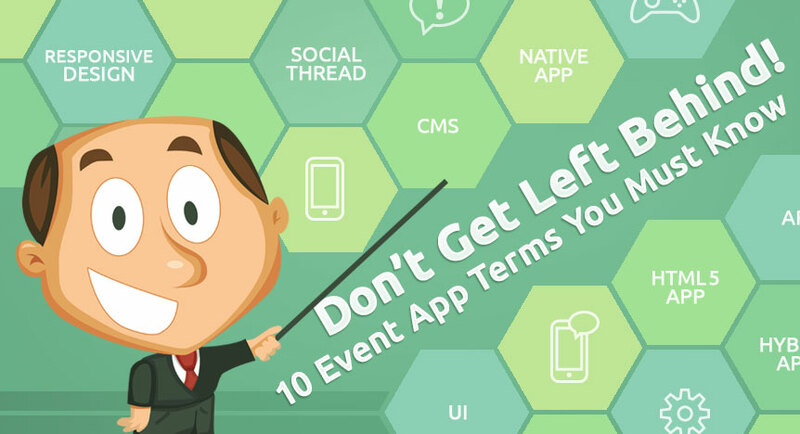 For example, in order to run on both iPhones and Android phones, your event app must integrate smoothly with the API for each kind of device. Responsive Design: The discipline of creating mobile websites that will scale up or down and rearrange content elements to fit the size of device they’re being viewed on. In event app context, will it look good on your smartphone, tablet and desktop? It should. Content Management System (CMS): Affectionately known as “admin,” the CMS is the interface where you (or, in JUJAMA’s case, we) load your conference data—attendee info, schedule items, etc. Social Thread: The string of comments, photos, etc. created by you and your attendees on your in-app social feed. Familiar public social networking terms such as Follow, Like and #hashtag apply. Gamification: The use of games in your event app to promote user engagement and to drive desired behaviors, such as visiting exhibitor booths or participating in surveys about the event. Polling: The event app feature that allows the audience to respond to speakers and discussions in real time. A capability formerly provided by clicker boxes, now performed right from the attendee’s phone or tablet.